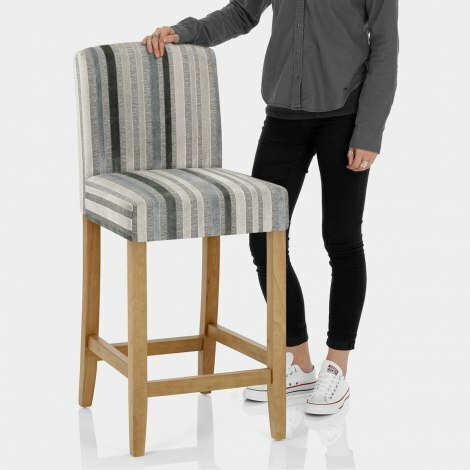 The Carter Oak Bar Stool Cambridge Stripe is designed to impress. Sure to complement a traditional space or bring a touch of elegance to a modern interior, the Carter is a stylish and versatile choice. The seat is amply padded for your comfort, and the striped velvet fabric gives this classic design a fashionable twist. What’s more, the tall backrest offers ample support. Dependability is guaranteed with the solid wooden frame, complete with a natural oak grain finish and strengthening bracing bars that double as a footrest. In addition, each leg is also complete with a discrete protective pad to reduce damage to your flooring. "The stools are very substantial and stylish"
Thought these would look good in our new grey kitchen for the breakfast bar. Though some self assembly they were easy to put together. The stools are very substantial and stylish, lovely material and very comfortable. Exceeded expectations. The next day delivery was problem free and these gorgeous stools finished the luxurious look of our new kitchen. Perfect. Found them to be what I was looking for in my new kitchen.